Harley Quinn cosplay costumes have become a dominant presence at every con imaginable. Many of the characters in the superhero genre have been around for almost half a century, if not more. This is what gives them that sense of almost being legendary, but one particular character has become the fastest legendary character in recent memory of comic books. Harley Quinn. For many it comes as a massive surprise when you mention that Harley Quinn was only invented in 1993. Although originally only meant to be a henchman of The Joker, Harley Quinn has proved to be a powerful feminist icon in more of her later incarnations, and with any popular character you can bet your bottom dollar that there is a lot of cosplay, and Harley Quinn is no exception. Here are some of our favorite Harley Quinn cosplay costumes from the different incarnations of the character. Many of the characters in the superhero genre have been around for almost half a century, if not more. This is what gives them that sense of almost being legendary, but one particular character has become the fastest legendary character in recent memory of comic books. Harley Quinn. For many it comes as a massive surprise when you mention that Harley Quinn was only invented in 1993. Although originally only meant to be a henchman of The Joker, Harley Quinn has proved to be a powerful feminist icon in more of her later incarnations, and with any popular character you can bet your bottom dollar that there is a lot of cosplay, and Harley Quinn is no exception. Here are some of our favorite Harley Quinn cosplay by the different incarnations of the character. When the DC comic book universe was rebooted in 2011 in what became known as The New 52, much of the attention was focused on the new incarnations of Batman, Superman and the rest of the Justice League. However, despite much of the flak that The New 52 would receive from the comic book diehards, one of the unintended side effects was that the character of Harley Quinn got far more attention that normal. She became the face of the Suicide Squad and had her own line of comics for a period. This version of Harley was far skimpier than the rest, but she was perfectly comfortable in her own skin and her outfit reflected that. Some of the New 52 Harley Quinn cosplay was actually banned from several conventions for being too provocative, but let’s be honest, if that doesn’t evoke the original character then what does? This is of course part of the fun of Harley Quinn cosplay costumes. Even The New 52 Harley Quinn went through several changes before the run was over, switching from costumes that were far more evocative of the original animated series, then back to the opposite extreme where she is hardly wearing clothes at all. If there was one thing the comic book genre was infamous for, it was for terrible video games. There were rare exceptions, but almost any superhero game was critically panned and commercially never did very well. This changed however with the release of Batman: Arkham Asylum and changed the entire genre for ever. Developer Rocksteady took a gritty and horror perspective on the universe of Batman and the infamous insane asylum that housed some of his greatest villains, including the one and only Harley Quinn. This rendition of Harley was done to reflect the medical wing of Arkham Asylum and so the aesthetic of a nurse was adopted into the Harley costume. The costume of Harley changed from Arkham Asylum to its successful sequel Arkham City fairly substantially, but we personally love the influence that her environment had on her costume and hope to see more like this in years to come. Besides, it’s hard to make a nurse look a little creepy, but Harley Quinn does it in absolute spades. One of the most replayed cutscenes of the entire game is when she introduces herself through a flat screen TV. Memorable for her instant charisma and the fact that she had just captured the warden of Arkham Asylum, Arkham Asylum Harley Quinn cosplay costumes are often unfairly overlooked, but we believe it is one of the best. Unless you’ve been living under a fairly impressive rock, then you’re bound to have heard about this incarnation of Harley Quinn. When the cast list was announced for David Ayer’s Suicide Squad, there was some controversy about the casting of several characters like Deadshot or Captain Boomerang, but what almost all of the geekdom was happy with was the casting of Margot Robbie as Harley. She brought lots of energy and vitality to the role, and despite the so-so to negative critical response to the film, what praise that is given is usually directed in her direction for being an instantly magnetic character to watch. This incarnation of the costume uses a far more realistic idea of a superhero costume, incorporating a simple shirt and (very) short shorts to achieve a look that is still distinctly Harley, but seemingly grounded enough that you could believe it if you saw it in the real world. Even the makeup that usually consists of an entirely white face has changed somewhat. Although the face is still white, long mascara tear marks and ponytails that are dyed blue and red give the whole outfit a more accessible and realistic feeling. The film didn’t even need to be released before the cosplay was coming thick and fast from around the world, and I highly doubt we’ll see the flow stem any time soon. There are several things that you can be reasonably certain of when it comes to the cosplay world. There will be controversy over female cosplay, there will be extraordinary amounts of money spent on costumes, and that there will always, always be a steampunk variation of any character you can think of. 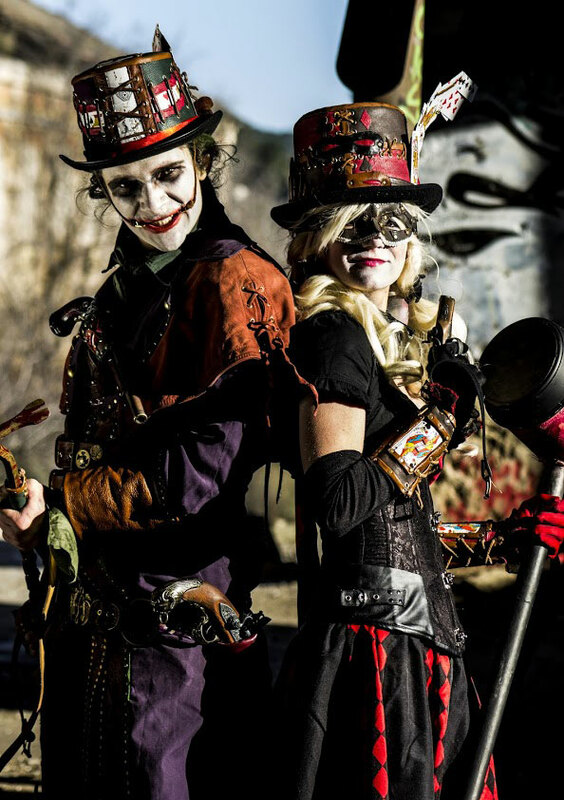 You can prove my point by typing in the word "Steampunk" before any superhero or villain to see what I mean, and of course, Harley Quinn cosplay costumes are no exception to the rule whatsoever. There isn’t a uniform look for steampunk Harley Quinn, but the general features tend to be a small pair of pilot goggles and the introduction of clockwork mechanics wherever they can fit across the costume. Some cosplayers will even try to interpret the Harley Quinn costume into a Victorian London setting in order to get closer to the steampunk aesthetic to some startling success. Common elements are a comically small top hat, typically emblazoned with a skull and crossbones and a massive wooden mallet to tie the whole thing together. This is perhaps one of the more creative Harley Quinn cosplay costumes that you can spot in the wild. Harley Quinn is so popular that it's not just girls who like dressing up as her. You know a character has become super popular when you see every con filled to the brim with gender bent crossplay versions of the character. 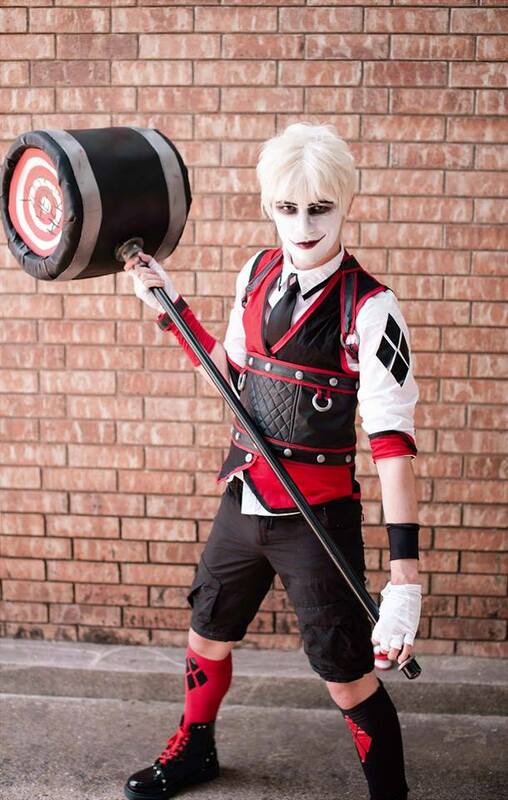 The ubiquity of Harley Quinn cosplay has let to an incredible proliferation of so many gender bent cosplay with guys getting in on all the Harley Quinn cosplay costume fun. The gender fluidity of crossplay Harley Quinn just goes to show how the character's fun spirit is malleable for any fanboy or girl to let their fun flag fly. Batman v Superman's Real Battle Is Fans v Critics – But What Does It Say About Us?